How to teach yourself piano and stay motivated? Piano playing tips and advice to stay on track! As you are beginning piano lessons, you probably want to learn more about our fantastic instrument! Here you will explore the history of the piano, layout of the keyboard, names of the keys and more. Learning the piano, with or without a piano teacher, is a process that can be done in any number of ways. Here is a plan on what steps you may take when you want to learn the piano from scratch. Here are the 10 best and most requested classical style piano songs suitable for every occasion. Chord piano is very useful for any pianist to know, and it can be very easy. 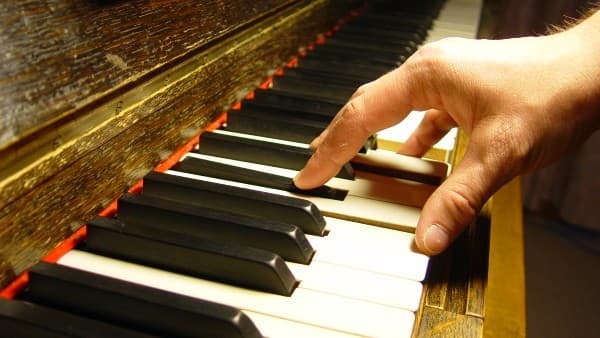 Learning to play chord piano is also a quick way to sound good playing the piano! With very little piano playing "under your belt", you can play chords to many songs using very simple techniques. As you get better and better you can play more complicated chords, and learn many different ways of playing the chords and making beautiful accompaniments. But in the start, it sounds good just playing simple 3 note chords by themselves, or with a melody. How do you learn chord piano? First learn the notes on the piano keys. Learn the finger numbers for playing piano. Learn what the chord symbols mean. In the very beginning, the only thing you need to know is how to play a major vs a minor chord in root position. You can learn all about the numbers and other symbols later. Start by playing the basic chords in your right hand, then add the bass or root note in your left, you can even double it by playing an octave. Now, find a favorite piece with chords; Try Beatles Yellow submarine that you can print for free here. First learn the chords and to play them in your right hand. Sing or hum the melody as you do. Add the root of the chord in your left, you can play an octave with fingers 1 and 5. That's it! If you want to play the melody too, first learn to play it with your right hand. Then learn to play the chords in your left hand. Finally, play the melody and the chords together and change the chord where it's written above the melody.